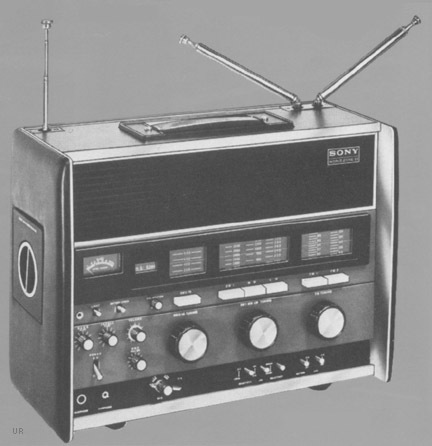 The Sony CRF-230 World Zone is a solid-state, double conversion radio that has a total of 23 bands. This includes two FM bands, 17 shortwave bands, medium wave and long wave (150-400 kHz). The front panel has controls for: Bass, Treble, BFO and volume. There are switches for BFO, Noise Limiter, Sensitivity, Muting, Power, Dial Lamp, Battery Check. The analog frequency display utilizes a sliding film for greater shortwave frequency accuracy . There are dual telescopic antennas for FM and a single telescopic antenna for shortwave. It operates from AC at: 100/117/220/240 VAC 50/60 Hz, or 9 VDC or six D cells or the optional Sony DCC-2AW car battery cord. The rear panel has antenna jacks, plus line out, aux. input, MPX out, speaker out and record output. 17.9 x 12.8 x 7.5 inches 30 lbs. Click here to view larger. The later model Sony CRF-230B is similar.